Which we get … everyone loves a bargain. And expats tend to want more than the luxury brands they loved at home. They also want to check out high-end luxury European brands they might only have read about in Vanity Fair and Vogue such as Bottega Veneta, Loro Piana, Marni and Brunello Cuccinelli. So, we’re finally getting around to updating Part 2, and there’s been a lot happening since we first posted more than a year ago. The dominant players – McArthurGlen and Chic Outlet Shopping (both based in London) – are expanding their properties or are building new ones. By our guestimate, McArthurGlen alone has invested about 200 million euros since 2015 just on expansions in Italy and the Netherlands. What’s most amazing is the popularity of the high-end fashion outlets across Europe against the backdrop of declining brick-and-mortar retail sales in the United States as e-commerce grows. In the U.S., malls are closing and fashion retailers such as Abercrombie & Fitch Co. and Rue21 are crashing and burning. In Europe, which has far fewer square meters of retail compared to the U.S, shopping outlets for high-end bargains, is only growing in popularity. From our personal experience in the Netherlands and France, this is really about a superior user experience. Fashion outlets here in Europe are architecturally well executed, interesting little retail villages (especially in Italy) compared to cheap, sterile strip malls in the U.S.
On the commerce side, just as most of the ultra-luxury consumer goods companies are owned by a few conglomerates such as LVMH and Richemont, McArthurGlen Designer Outlets and Chic Outlet Shopping own the majority of fashion outlet centers. U.S.-based companies including Simon Properties, based in Indianapolis, had plans to jump into Europe. But we’re thinking they have their own issues at home right about now. We’re focusing on Italy in this installment because we omitted Serravalle in favor of The Mall in Tuscany in our original post, and because Italy is the fashion center of the world. So, get your MasterCard and chipcards from Euro banks warmed up because it’s pretty hard to use those American Express Black Cards in Europe. This is one of the newer and larger outlet centers in the very competitive Northern Italy outlet scene … and it just got a facelift. 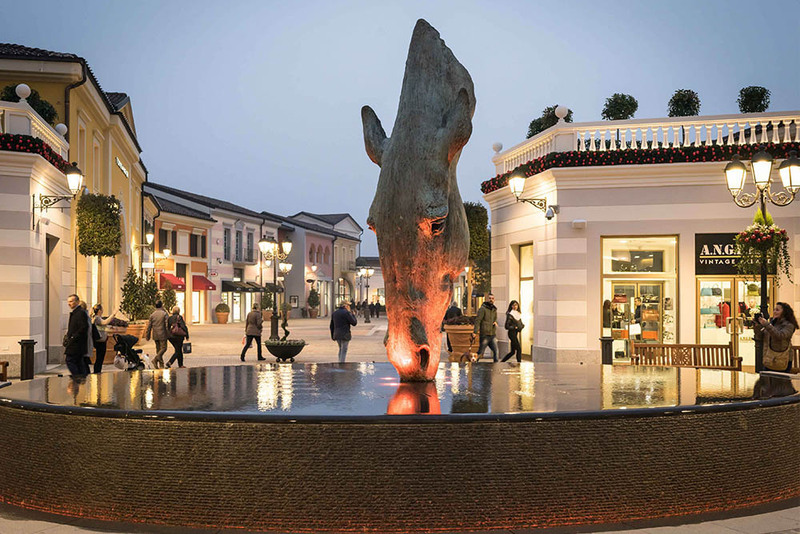 Dispatches just got a news release stating Franciacorta Outlet Village has expanded – 5,000 meters square of buildings, 30 new retail units, an elaborate new playground and a regional tourist information center. That takes the center out to more than 38,000 m2, or about 9.5 acres, with a total of about 200 stores. • Romeo Gigli, an haute couture brand with prices to match. You’ve probably never heard of Romeo Gigli, but he’s one of the most influential of the contemporary Italian designers, and his stuff sells out fast … even the 1,800 euro patchwork denim jumpsuits! This is on the other end of the spectrum from Brunello Cuccinelli’s understated approach. • Angelico, an Italian brand focused on mid-range men’s apparel. • Cinzia Rocca, a mid-to-upper range women’s designer brand. • PINKO, an upper-range, high-fashion indie brand for young and young-ish women. Franciacorta Outlet Village also has all the usual suspects including Tommy Hilfiger, Champion workout gear and there are emerging brands such as Napapijri, the Italian outdoor brand whose bright colors are kind of a thing with the hip-hop generation. The news release states that SOLIDS, a Milan-based architectural firm, designed the extension to echo the original village design, which has a circular “square” at its center with its restaurants. So this outlet fashion center is meant to give shoppers an experience, and in return, the shoppers stick around. Voilà, as the French say. One of the best I have shopped in. Definitely one of the best outlet mails with amazing value in July. I’ve been four different times and it continues to grow and get better and better. Same same same. The huge complex hides alot of stores with different quality. But spend a few hours here and you will see that there is alot of the same things in the stores. Overall it is an ok shopping opportunity and there is a lovely gelateria that makes top notch cones. Torino Outlet Fashion Village is one of the newer outlets in Europe, open for about one year. It’s also one of the few that made the architectural mags with its clean, ultra-modern design by celebrity architect Claudio Silvestrin rather than the faux-classic buildings at other outlets. One of the more notable features is the 111-meter-tall minimalist spire that beckons to shoppers searching for luxury bargains. Once they get to Torino Outlet Fashion Village, they’ll find a large center with 90 shops arranged along two open-air streets with a 290-meter-long promenade. Among those 90 stores are some stellar brands. We’re going to start with our favorites including Armani Isaia, Zegna, Jil Sander and Malo sweaters. Finally, there are lots and lots of shoes including Cesare Paciotti as well as brands you see pretty much everywhere including Calvin Klien, Tommy Hilfiger and Desigual. The real reason to go – outside of getting a shot at discounted Italian brands – is the architecture. You can read about architect Silvestrin’s approach here. The design is pretty revolutionary, using the highest grade local building materials in a tranquil setting outside noisy Torino is meant to make you want to linger longer so you’ll spend more. Hey, that’s good business. The center is owned by Arcus Real Estate based in Milan. Arcus executives have announced that starting late this fall, Phase 2 will take Torino Outlet Factory Village to 32,000m2, or 8 acres, from 20,000m2 now, with 50 additional stores. Very modern, well-designed outlet center with some interesting shops. We particularly like the high-end brands such as Gucci. Gucci has a very nice collection for an attractive price in their outlet store, although you shouldn’t expect ultra exceptional discounts there. Another interesting store is Richard Gionori for luxury china. We knew the brand very well already and we had just before visited their beautiful regular store in Firenze. In their Torino outlet store we got a very interesting deal on some plates. North of Genoa and an hour from Milan, Serravalle Scrivia was the first “village-style” fashion outlet in Italy, and McArthurGlen’s first foray into the country ca. 2000. Last year, the outlet got a 115 million euro expansion, exceeding 50,000m2 (12 acres!) Now, it’s billed as the largest in Europe. This is Italy, so Gucci, Prada and Armani are among the 300 brands. But there are also the crème de la crème of Italian fashion houses you don’t typically see at the other outlet centers including Brioni, Canali and Corneliani. There are also multiple shoe retailers such as Guiseppe Zanotti, A. Testoni and Bally. Finally, there are couture/bespoke brands most Americans have never heard of including Cinzia Rocca and Bluemarine. OR, you can head to the Ralphie store and get 20 euro tees and 60 euro jeans. But you didn’t come all the way to Italy for that …. We visited this Outlet every time we visited Milan. A number of bus operators offer transportation from Milan city centre, making it quite convenient for shoppers. The customer service office at the Outlet sometimes offer 10% discount to foreign visitors for certain brands so worthwhile to check it out. The outlet offers premium as well as mid range brands, but the premium brand shops at The Mall near Florence are bigger and have better merchandise. This year we found a Tax Refund Office new at the Outlet. However, it does not refund in Euro (exchange losses) and charges a big admin fees. It is now much easier to do tax refund at the Malpensa airport. Okay, Northern Italy is where this gets serious. Also home furnishings from Callefi and Frette (our personal favorite) and lots and lots of shoes including Jimmy Choo. This is all stuff you’re never, ever going to see at the mall. Often outlet malls have cheap made for outlet malls clothing, but not this one. All high quality and from recent season. Restrooms are superb, clean and private. They are still expanding and I wished they had a Gucci store. For now Prada, Armani, Blue marine, Dolce & Gabana, Coach and many more. Worth a stop. This is a medium size, beautifully designed outlet. The place is very nice to walk in and have lots of nice stores. the problem is that the prices are not cheap enough. Even though we were sure we would buy a lot of things there, we eventually bought only one item only, we just didn’t manage to find bargains …. • Designer Outlet in Noventa di Piave near Venice. This is another McArthurGlenn center. McArthurGlenn has four more developments in Italy: Designer Outlet La Reggia, near Caserta; La Reggia in Marcianise, Noventa di Piave inVenice and Castel Romano in Rome. Okay, we haven’t made it to Las Rozas. But the website makes it clear that this is an upscale discount experience (if that’s not a contradiction in terms), with services such as personal shoppers and, better (though limited) dining and even a free kennel for your four-legged friends. The shopping options are also a bit more esoteric, with Spanish and Italian boutique/prêt-à-porte brands including Adolfo Dominguez, Bimba y Lola, Hoss Intropia and Roberto Verino. There are also the regular regulars including Superdry (big in the Netherlands right now.) Also lots of housewares and cosmetics. Even the “meh” reviews on TripAdvisor rate this as the best fashion outlet choice in Madrid. Lots of shops for everyone from adults to kids. I enjoyed the outdoor area and thought this was great for finding something special. There are lots of designer stores but also more budget shops. You can spend a whole day just walking around in the sun. Playground for little kids. A few food options. There is also another mall with more food and games right next door Send me a note if you have any questions. If this was helpful click on the thumbs up. • La Roca Village in Barcelona: Like La Rozas Village in Madrid, La Roca Village is part of the Chic Outlet Shopping chain. La Roca Village has basically the same offerings as La Rozas, with 130 boutique stores. But this place also has boutique beer! Great place to shop. It can be hit and miss with the bargains. Not very big so you can be done in a couple of hours. Would recommend obtaining the 10 percent VIP discount card prior to your visit and do a thorough research of the shops on line before your visit. McArthurGlen is throwing down the gauntlet to Chic Outlet Shopping with plans for its first center in Spain. Late last year, McArthurGlen executives announced their company, in a partnership with Lisbon-based shopping center developer Sonae Sierra, would build Malaga Designer Outlet in far southern Spain. At a planned 300,000 square feet and 170 stories, the 115 million euro project would be the largest fashion outlet in Spain. The first phase is scheduled to open at the end of 2018, according to Spanish industry pubs.